Winking sensation Priya Varrier will be playing the iconic Sridevi in her debut film in the Bollywood film industry. Present at the teaser launch of film Sridevi Bungalow at The View in Mumbai yesterday, the young actress said. 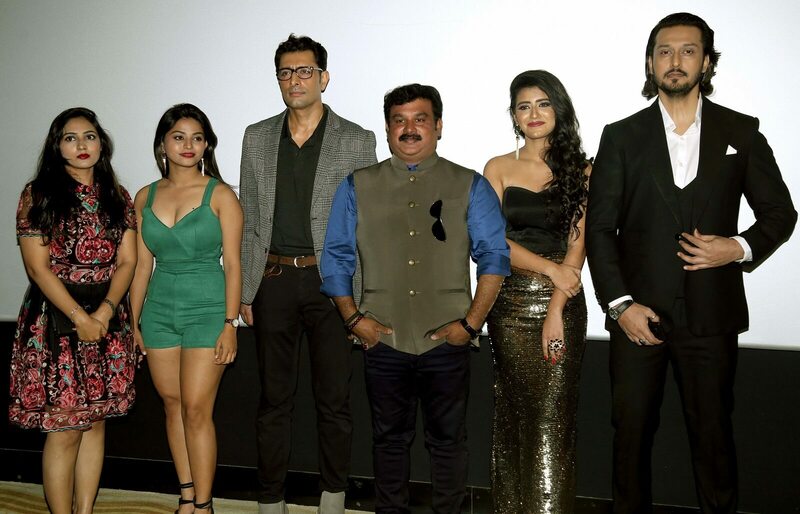 ”People know me as a wink girl but what I want is that people accept me as an actress as a whole and not just with a wink,” Other actors present at the launch were Priyanshu Chatterjee, Aseem Ali Khan and Dinesh Lamba. Keen to make an impression as an actor and not just as a viral social media star, Priya is determined to do justice to the role she’s playing in Sridevi Bungalow who trailer was launched at the event. The film revolves around the life of the central character, Sridevi. At the very beginning, she can be seen giving an autograph and the film establishes that she is a well-known star. As the teaser progresses, one can see various shots of Sridevi (Priya Varrier) enjoying a luxurious lifestyle. The film is produced by M N Pimple, Chandrasekhar SK and Roman Gilbert of Aarat Entertainment. Prasanth Mambully is directing the film. The film is co-produced by Rajan Gupta and Manish Nair . 4 musics have composed the song for this film which will be shot in London from 25th January. WINK WINK Priya Varrier is the Most Wanted actress of India!